Notes from my recent flight from San Francisco International (SFO) to Copenhagen (CPH) on SAS. >SAS flies an Airbus A340-300 on the route with 46 seats in business class, 28 in premium economy and 171 in economy. There is no first class on this flight. The flight I took was completely sold out. >Roundtrip fares this summer are running in the $1,500 range in economy, $1900 in premium economy and $2,800 in business class (this summer business class fare is a remarkably good deal from the west coast!). SAS is a Star Alliance carrier. >SAS Flight 936 departs San Francisco six days a week (no Tuesday flights) at 5:35 pm and arrives Copenhagen at 1:15 pm. On the return, SAS flight 935 departs CPH at 12:25 pm and arrives at SFO at 2:45 pm the same day. Flight duration is about 11 hours. >To understand a lot of what I’m going to say about the business class experience on SAS, you must first know about the Danish concept of hygge. (Sounds like “hoo-guh”) There is no word in English that truly captures the meaning of hygge; the closest we get to it would be “cozy.” But from what I picked up from the Danish, hygge is all about warmth, camaraderie, familiarity and comfort. Think about the feeling you get when you see candles burning in a window on a cold, wet night. The smell of baking bread or cookies. Or an afternoon cuddled up next to a fireplace in a big chair with a blanket, a cup of tea and a chat with your grandmother. In nearly everything they do, Danes seem to aspire to create a feeling of hygge—even on an Airbus A340! >The timing of the departure of SAS at 5:35 pm from SFO is near ideal. Taking off at 5:35 pm means you can have a full day at work. Then a nice cocktail after take off (see slideshow for eclectic bar menu), a lengthy dinner service, watch a movie and get some rest prior to arrival. >Looking out the window at SFO’s International Terminal, the SAS Airbus A340 sports a grayish silver fuselage with the word “Scandinavian” in white and barely detectable along the side. The tail of the aircraft is navy blue, and each of its four engines is bright red. >Upon entering business class, the best thing I can say is that it’s well, hygge…low-slung seats are configured 2-2-2, and the cabin feels open and airy, yet cozy with deep red curtains and light brown suede-ish walls. Although well maintained and clean, the blue fabric seats trimmed in gray plastic and light brown leather look and feel dated. >Inflight entertainment screens are small, distant from the seat, and grainy—a far cry from the crisp, newer generation video screens now installed on most international carriers. Additionally, there is absolutely no in-seat storage space—all bags, purses and briefcases or laptops must be stowed in smallish overhead bins for takeoff. On the positive side, every business class seat has a 110-volt electrical outlet. >SAS joins fellow European carriers Lufthansa and Air France with an angled lie-flight seat, unlike the preferred truly horizontal lie-flat seat we know and love on transatlantic flights from SFO on United, British Airways and Swiss. 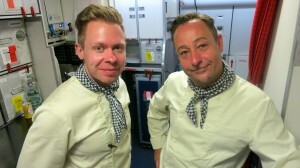 >About half an hour into the flight, cabin stewards changed into chef outfits to serve meals! They come out serving in starched tan shirts with black and white checked scarves (or kerchiefs of some sort) tied around their necks, and full length aprons. Very cute and classy, and very hyggelig! (See slideshow) There was even a mom-like purser who walked around, smiled, passed out blankets and pillows and made sure everyone felt comfortable and attended-to. I have to admit that these nice soft touches turned my attention away from the hard product described above. This was fun…and felt good. >Business class meals were hearty and very good. I was especially impressed with the array of bread and crackers in the frequently passed basket. See the slideshow for some close ups of these tasty meals. I’m not sure if flight attendants do this for hygienic reasons, but they served all plates covered in clear plastic wrap that passengers had to remove. Why? >After a nice meal and a glass or two of wine, I became tired, donned my Bucky eye mask and the noise canceling headsets provided, and fell asleep… for nearly five hours! The angled lie-flat seat did not prove to be as uncomfortable as I expected. >For breakfast service, flight attendants changed once again… this time into suits and ties… to serve. >I took some time to crawl around the plane and snap photos of nearly everything. Be sure to see the slideshow for a look at the oversize business class lavatory—with two windows, a full length mirror and a toilet positioned at an unusual angle. >The SAS premium economy section is located in the first few rows of the coach section. Seats are slightly large and wider than regular economy, and configured 2-3-2. I saw that many passengers had enough room to stretch out and work on laptops. Each seat has its own video screen. 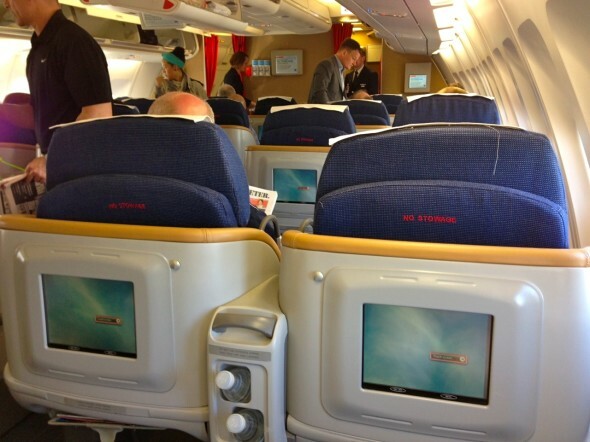 >The economy cabin is configured 2-4-2 and each seat has its own inflight entertainment screen. >Arrival in Copenhagen airport was easy. I was very impressed with the warm, sustainable and gorgeous stained wood flooring used throughout terminals. (See slideshow) The airport is small and manageable…and there’s a quick (15 mins) and easy rail link to Copenhagen Central Station. >On my return, I took a quick look at the SAS business class lounge at CPH. It’s a big, bright and airy 2-story affair, with a very generous selection of food, salads, Carlsberg beer on tap. All tables in the dining area are topped with pots of live herbs. There are several cozy seating areas, a fireplace (see what I mean about hygge?) plenty of workspace, free wi-fi and a table full of new Macs and printers. >The SAS lounge at CPH is head and shoulders above the hospital-like environment of the United Business Class lounge at SFO, which could use a little hygge help! Overall, I really enjoyed this trip—in both directions. Despite the angled lie-flat seat, I was able to sleep, work, and enjoy meals. The quality and cheerfulness of inflight service made up for the less-than-stellar hard product. Stay tuned for a slideshow of the highlights of my quick three day stay in Copenhagen where I check out the latest, greatest hotels, dined on new Nordic cuisine, and buzzed around town in an electric card!